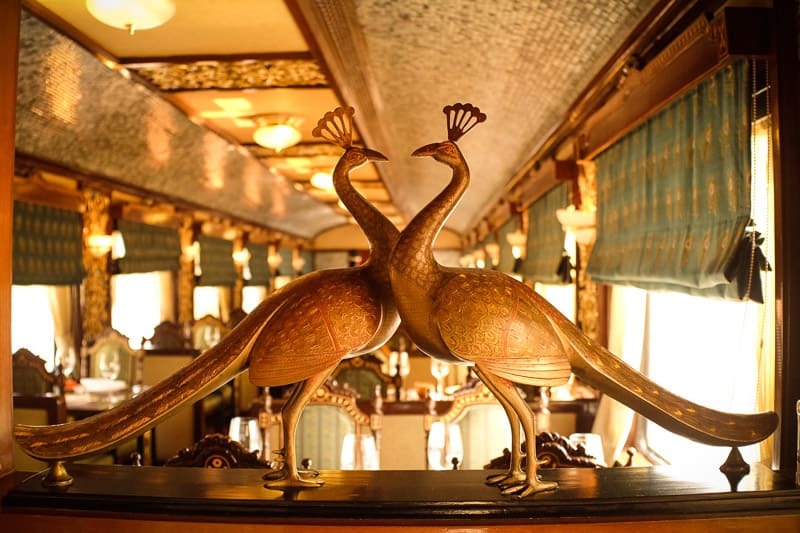 What are luxury trains in India like? 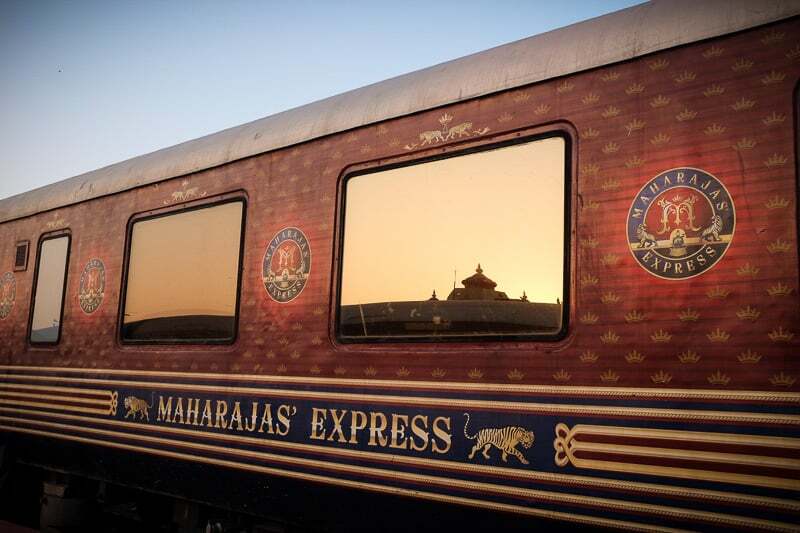 The Maharaja Express train has been voted “The World’s Leading Luxury Train.” Owned and run by the IRCTC, the Maharaja Express travels several routes throughout North and South India. 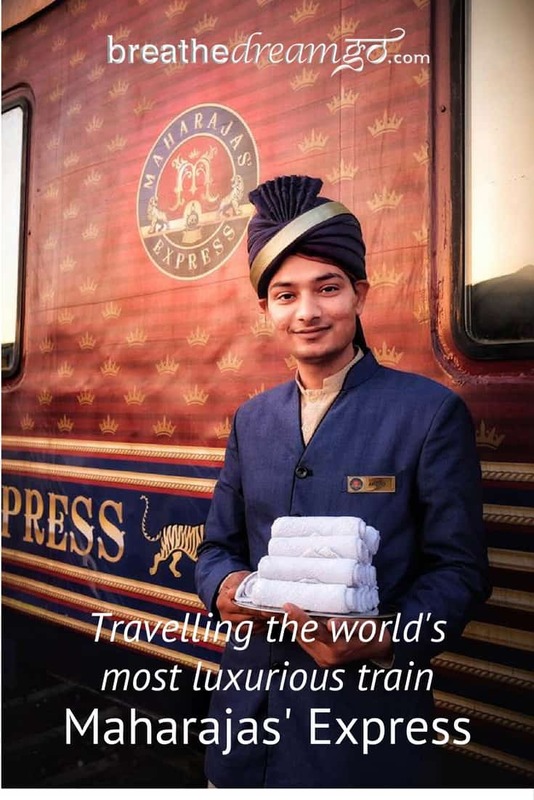 Photographer Andrew Adams and I were invited aboard the Maharaja train to experience life on an Indian luxury train. 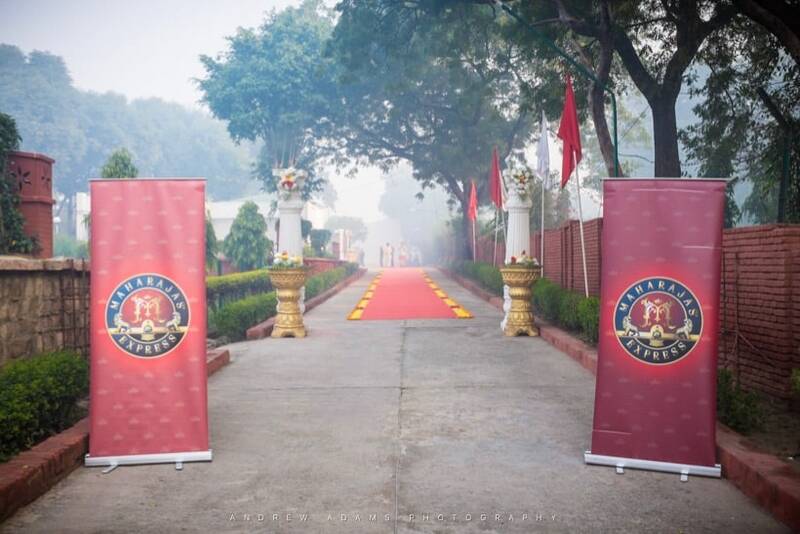 For eight days, we travelled The Indian Panorama route on the Maharajas’ Express across four states in North India. We started in Delhi and travelled to Jaipur and Ranthambhore in Rajasthan; on to Agra for the Taj Mahal; then Gwalior and Khajuraho in Madhya Pradesh; and finally Varanasi and Lucknow in Uttar Pradesh. ON MY FIRST MORNING on the Maharaja Express train, I woke up and was greeted by a knock on the door and the sight of the Rajasthan scenery outside my picture window. I opened the door and my valet Bansi placed a big mug of ginger-lemon-honey tea on my bedside table. With a happy smile, he told me breakfast would start at 8, we would be reaching Jaipur at 10, and assembling in the Safari Bar to begin our tour of the Pink City. He then handed me a card with the weather forecast on one side – sunny and a maximum outside temperature of 23 C. – and an “Amusing Anecdote” about Jaipur on the other. After he left, I settled back in my comfortable bed to sip my tea, read about Jaipur, and watch the scenery flow past. 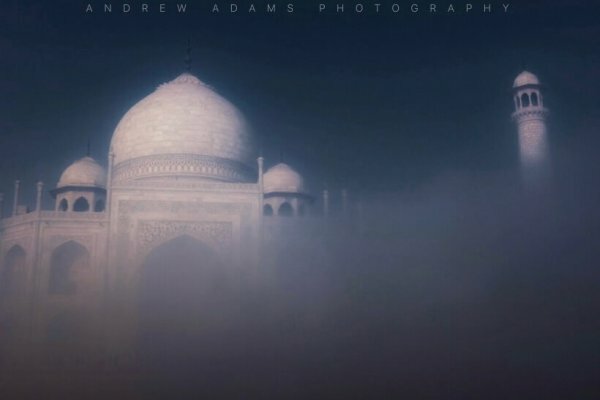 It was a foggy morning in February, but the sun was burning off the fog, and the scrubby desert and rolling Aravalli Hills were appearing through the mist. It was one of those perfect travel moments, when adventure and comfort line up like illuminating stars in the night sky. I’ve spent a lot of time on trains in India, but never had I slept in my own room, in a real bed, with a full-size attached and private bathroom. It honestly seemed too good to be true. To put this on context: while travel in India is a great adventure, it’s not the easiest or most comfortable thing to do. I usually travel in 2AC or Second Class, often on very long journeys. Train platforms in India can be very trying, the trains are usually full and often late, and you have to cram in with a lot of other people. The cars are old, the bathrooms are unpleasant (and sometimes disgusting), and there are very few amenities. Yes, it’s an adventure. But it’s arduous and exhausting, too. This luxury train is the opposite of all that. Our first day or two on the train was like Christmas morning. 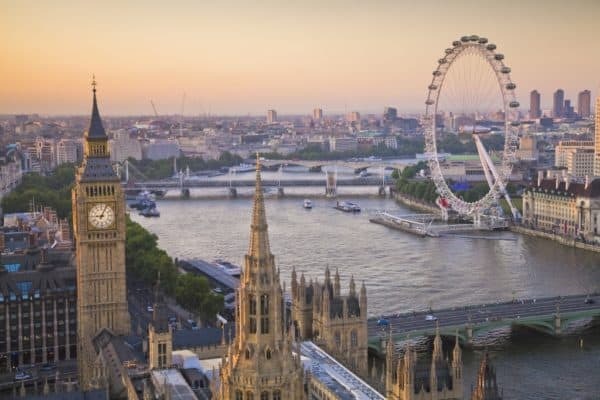 Andrew and I were both genuinely excited by the novelty, the luxury, the privacy of our own rooms, the extremely high and exacting standards of service, the quality of the food, and the pomp-and-circumstance of the boarding and disembarking rituals. I almost leapt for joy when I saw my very own full-sized shower! 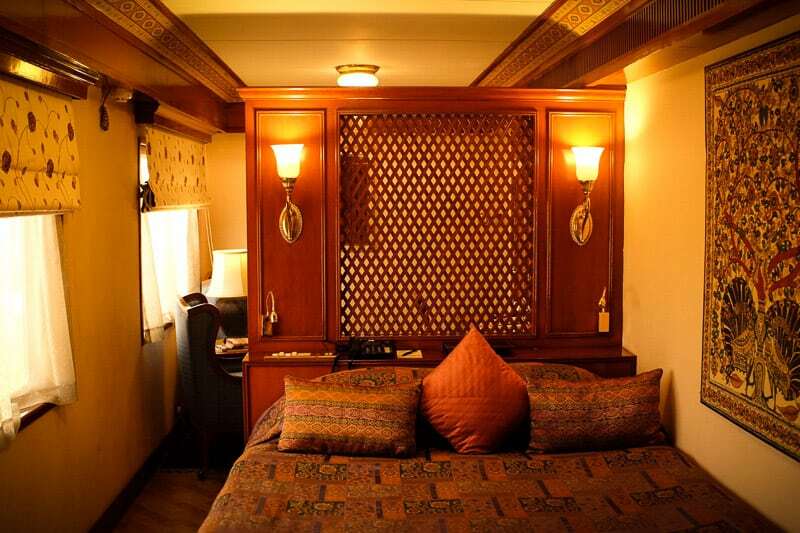 The Maharajas’ Express was custom built about six years ago, to the highest standards. At almost half a mile long, the train is composed of 2 dining cars, 2 bar / lounge cars, 1 kitchen car (where all meals are prepared to order), 20 Deluxe Cabins, 18 Junior Suites, 4 Suites, and 1 Presidential Suite. Photographer Andrew Adams and I were invited to ride the train in February 2017 and experience all it has to offer. We were each in Junior Suites, in the Gomed car. Each car is named after a precious gem – ours was the gomed, or garnet, in English. Our itinerary, The Indian Panorama, started and ended in Delhi. We spent seven nights aboard the train, making eight stops, about one per day. The Indian Panaorama is one of the more ambitious itineraries, and it was a non-stop adventure. In the next blog post, I will write about the incredible destinations we visited … this blog post is about the train itself. 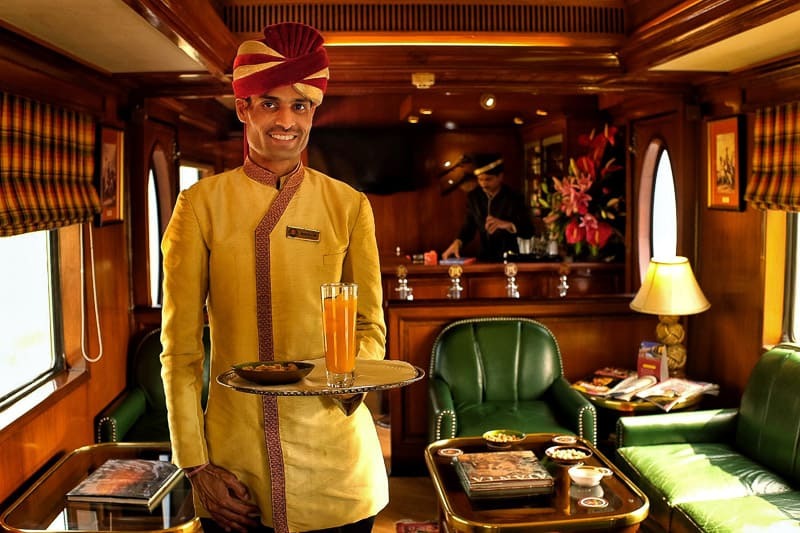 Luxury trains in India: What’s it like?! When we arrived at the private train station in Delhi to board, we were greeted by uniformed staff, live Indian classical music, flower garlands, and refreshments, along with all the other guests on the train. We were given a package of information about the trip, and escorted to our junior suites by our valet Bansi. We liked Bansi instantly. A tall, handsome Rajasthani man with a never-ending smile, he was always pleasant and fun, as well as helpful. 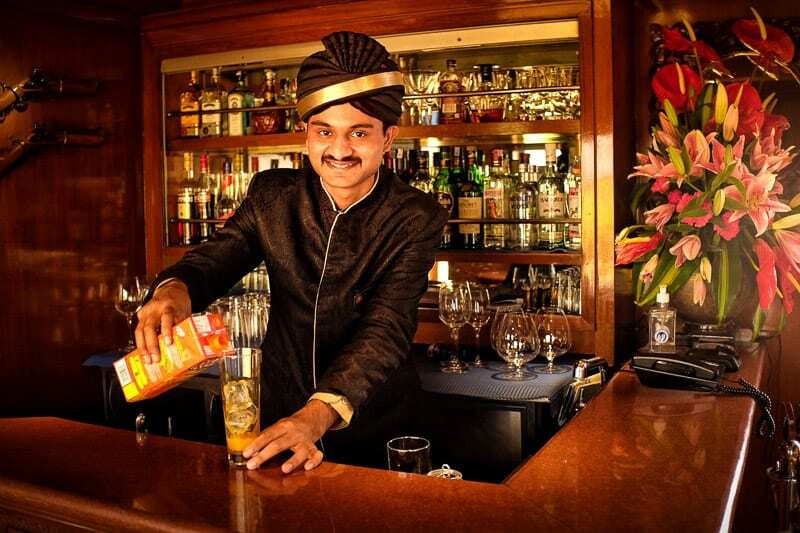 Every guest on the Maharaja Express train enjoys the services of a valet. They do everything for you, from bringing you tea in the morning, to making reservations, to taking care of laundry, and keeping you apprised of each day’s schedule. The days are busy, so having Bansi at hand to help make sure we were at the right place, at the right time, to disembark each day was priceless. He was also a very good sport about posing for us! Our first night on the train, we had a pre-dinner drink at the Safari Bar, and then made our way to Mayur Mahal. These cars are gorgeously decorated to evoke Indian colours, and also the elegance of the past. Mayur means peacock in Hindi, and sure enough, the Mayur Mahal is shades of blue and turquoise, with the richness of dark wood and gilt touches. Other nights, we ate in the Rang Mahal, a joyously orange-and-red room that was a little more plush, and a little less formal. Both rooms serve the same food, from the talented hands of head chef John Stone. To be perfectly honest, the food far exceeded my expectations. Not sure why I thought it would be institutional or bland … but it was neither. In fact, I ate some of the best dishes I’ve had in India aboard the Maharaja Express. And I must make special mention of the care Chef Stone took to cater to my gluten-free diet. I could easily write an entire blog post about the food on this luxury train. Each night, the kitchen served a continental menu as well as an Indian thali (plate of small dishes). 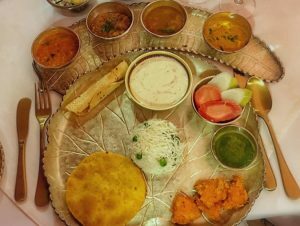 And each night, the thali dinner represented a different state, a different cuisine in India. On the first night it was a Rajashtani Thali, and you could order a veg or non-veg version. Another night was Punjabi Thali – my favourite – and so on. The presentation was as beautiful as the food: it was served in an ornate silver thali. 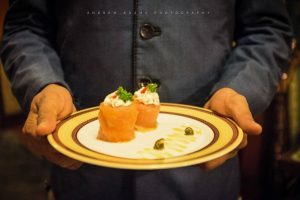 Presentation and doing things with a “royal” touch is the way they do things on the Maharaja Express and they leave nothing to chance. They make every occasion special. They think of so many details. Turbaned men offering cool or warm drinks depending on the time of day, sari-clad women throwing flower petals in the air, and live musicians playing, whenever the guests disembark. At several stations, local musicians and dancers performed, giving the guests a chance to experience the local culture before beginning their excursion. Indian luxury trains: An oxymoron? 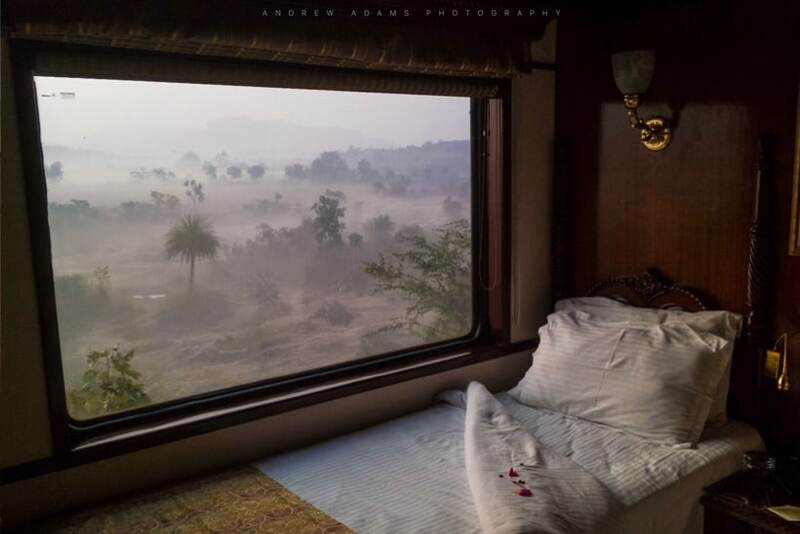 For an introvert like me, it’s hard to convey in words the luxury of lying in the comfort and privacy of my own bed, drinking tea, and staring dreamily out the window as the train moved through the Indian landscape. I enjoyed the ease and peacefulness of having my own room as I travelled through India, without having to pack and unpack. I also loved having good, nutritious, and hygienic food at hand, at every meal. These are precious luxuries to India travellers. The only real downside for me was that after a few days, I looked longingly out my window at the lively, colourful scenes as they passed, the crowded station platforms where chai and chaat sellers were plying their wares, the bustling streets and markets … and I felt cut-off from the “real” India. By the end of the trip, I couldn’t wait to get back into the melee of travel in India. That could be my special craziness, however. I think most people, including me, would appreciate the comfort and service offered by the Maharaja Express, which is why I would recommend it to those who can afford it. Virtually all of the guests aboard were foreigners, many from the United States, Australia, and various European countries. They were mostly older, though there were families with three generations travelling together. For these people, who might not share my sense of adventure, the Maharaja Express trip makes for a good introduction to India. I just hope they stayed longer in the country and got to know India at a more grassroots level.